It was close to this time last year that hubby and I were driving out of the neighborhood, and just as we neared the lake I yelled, and yes I mean yelled! “Stop the Car!” When this happens it usually means there is either a bee or a frog in the vehicle. Hubby always stops promptly, as moving cars do not hinder me from a quick exit when a creepy critter is involved. But this time it was different. It was “My Eagle”. Well…that’s how he came to be known after his second siting. I followed him all around the lake and walking area most of the winter. He is the reason I am healthy. He insisted that if I wanted photos of him, I would have to work for it. I am hoping that his safe summer travels bring him back to us soon. His beauty is inspiring. Majestic. Plus I need the exercise! ♥ Watching and waiting…. 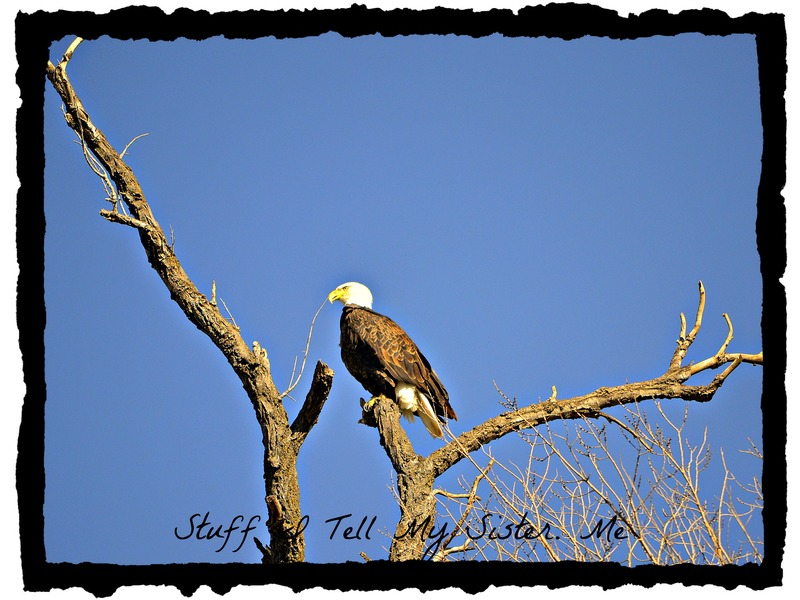 This entry was posted in Intrigued, Oklahoma, photos and tagged chasing the eagle, eagle, exercise, probiotics, The eagle, waiting, watchful, what winter brings. Bookmark the permalink. Beautiful images PSB…good for you to tell Marvin to stop the car and what a good man to listen! But, what do probiotics have to do with an Eagle? Or should I just not try to (over) analyze that? LOL! Good questions! Winter is approaching….with winter usually comes other not so welcome germy visitors…hence the probiotics. My fam gets tired of hearing “are you taking your probiotics?” 🙂 So in my mind it makes perfect sense! It’s my world…..♥ So are you, Bonnie? Do you really find frogs in your car? I’ve just heard that a pair of whooping cranes have stopped off at Lake Hefner and are hanging around the geese for awhile until the decide to head farther south. An endangered bird sighting for you, if you’re willing to drive and risk missing them if they have already left! Thanks….I will be in OKC next week…so we’ll see! 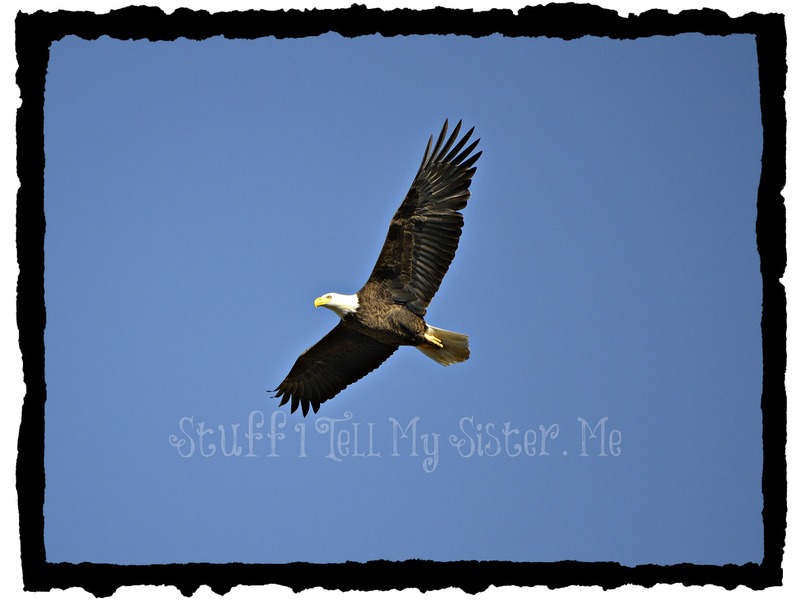 Super Awesome Photos Dudette! Seriously Paula, these are stunning and I am so glad you didn’t have to exit a moving car to get them. Happy wanderings this winter! A great horned owl and I share the same territory. Awakening to his screams for the first time frightened me under the covers. Having no idea what was making those horrific noises sent me searching for answers the next day. Past president of the Atlanta Audubon Society happened to be in a meeting I was attending and he recognized my less than accurate imitation of the sound. So now the search was on to actually see my new neighbor. He finally appeared early morning of Christmas Eve. What a wonderful present! I name my animal neighbors so my wise friend took on the title of Einstein. He came through to say hello just last week at dusk. Sorry–I got carried away because your post brought back all those same feelings for me. Thanks for that! That is awesome! I love your name for him. We had an owl for a time. Our description to our “bird man” was poor. He even had us listening to recordings to help identify the type….we never knew for certain and we have not “heard” him in quite some time. Very beautiful pictures. 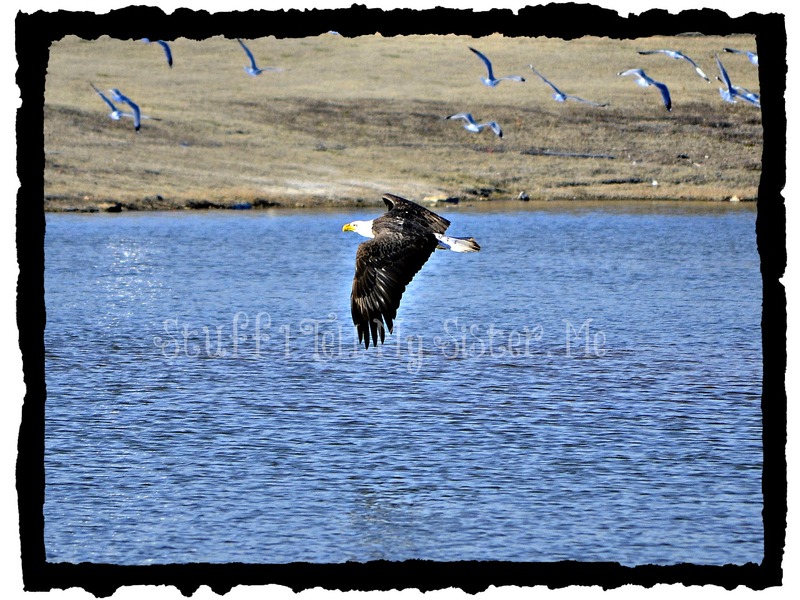 I agree that birds of prey that have such graceful beauty are an amazing sight to see. Going off topic, but there’s this huge Magpie that is hanging around my place these days. He is the biggest Magpie I have ever seen; his legs alone must be a cool twenty something centimeters in height. He walks with such an elegantly pretentious stride that one cannot help but stare in awe at his gorgeous plumage and shiny feathers as the other birds in his presence appear to bow and move out of the way from fear of being attacked by his great beak. I also agree that such creatures make us work for our photos; my Magpie refuses to hang around when I finally get my camera working. Magnificent photo of a magnificent bird. Sometimes it a great to stop and savour such moments. Paula, these are amazing action shots. Poetry in motion!